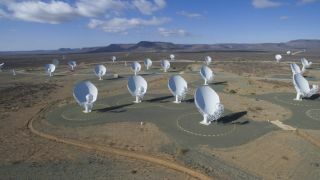 An overhead view of South Africa's MeerKAT radio-telescope array while it was under construction. The 64-dish network was inaugurated in July 2018. The hunt for intelligent aliens is ramping up. The $100 million Breakthrough Listen project will use the powerful MeerKAT radio-telescope array in the Karoo region of South Africa to search 1 million stars for signals from alien civilizations, project leaders announced today (Oct. 2). "Collaborating with MeerKAT will significantly enhance the capabilities of Breakthrough Listen," billionaire entrepreneur Yuri Milner, founder of Listen's parent organization, the Breakthrough Initiatives, said in a statement. "This is now a truly global project." The MeerKAT network was inaugurated just this past July. It consists of 64 radio dishes, each of which is 44.3 feet (13.5 meters) wide. Signals gathered by each dish are combined, significantly boosting data sensitivity and resolution as well as the observed field of view, Breakthrough Listen team members said. MeerKAT was designed to conduct a variety of astrophysics investigations and to help lay the groundwork for the Square Kilometer Array, an ambitious project that will integrate dishes throughout South Africa and Australia to create one gigantic radio scope. MeerKAT won't have to halt its baseline scientific work to accommodate the newly announced SETI (search for extraterrestrial intelligence) work. The Breakthrough Listen team has installed an instrument — basically, a small supercomputer — at the MeerKAT facility that will allow the search to go on in the background almost continuously. "With this new instrument, we'll be able to form many beams at the same time, obtaining high-resolution data for multiple objects simultaneously," Breakthrough ListenPrincipal Investigator Andrew Siemion said in the same statement. "This complements and extends our capabilities at other telescopes, enabling us to survey our cosmic neighborhood for technosignatures faster than ever before." There will be a lot of data to process. The Listen system at MeerKAT has a data-input rate of 4 terabits per second — about 40,000 times that of a typical home internet connection, Breakthrough Listen team members said. "This development represents a step-change for SETI research," said Michael Garrett, a co-investigator on Breakthrough’s MeerKAT and program director of the Jodrell Bank Centre for Astrophysics in the United Kingdom, a Breakthrough Listen partner facility. "Employing a large distributed array of hugely sensitive radio telescopes like MeerKAT is really a no-brainer, offering many advantages over large single dish surveys," Garrett added. "The Breakthrough Listen MeerKAT project can be a powerful new tool for SETI with the potential to completely transform the field." And in case you were wondering about the name: In its first incarnation, MeerKAT was to consist of 20 dishes and be called the Karoo Array Telescope (KAT). But the South African government increased the project's funding, allowing 64 telescopes to be built, and the team changed the name to MeerKAT. ("Meer" means "more" in Afrikaans.) The moniker is also a nod to the meerkat, a famously adorable member of the mongoose family that's native to the Karoo.